When John was about twenty, he went to Mass in the church of the Dominicans in a neighboring city. For the moment, it seemed to him that vocation was joining the Friars Preachers now, but St. John appeared to him, telling him he must go elsewhere. In 1619 he embarked for the Indies, where many Spaniards were going, either to convert the natives or to seek a fortune. After a long and hazardous journey, he arrived in Lima. 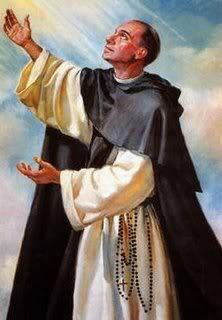 There were at the time four convents of the Friar Preachers in Lima: the College of St. Thomas; the house of St. Rose, where Sister Rose of St. Mary had died just five years before; Santo Domingo or Holy Rosary, where the holy lay brother, Martin de Porres, was performing such astounding miracles; and the convent of St. Mary Magdalen, which was small and poor. John decided to enter St. Mary Magdalen and, in 1622, he received the habit of a lay brother there. On the night of his profession, devils appeared to tempt and reproach him. He was attacked bodily, and, although he was called on Jesus, Mary and Joseph for help, the demons continued what was to become twelve years of torture, by actually throwing him from one cloister to another. John was appointed assistant to the porter, and lived in the gatehouse. There the poor came for food, and the rich for advice. He became adept at begging for the poor, always managing to find enough for the more than two hundred people who came daily for help. He had little use for the wealthy and curious, and would sometimes baffle them by simply disappearing while they were looking at hi,. Also, legend relates that he had a little burro that he would send out by itself, with a note asking for what was needed in one of the empty panniers on its back. Told where to go, the burro made his route faithfully; and if the rich man on whom he called was ungracious, or even hid himself to avoid giving alms, the little burro made quite a noise, and it quickly brought the desired results. Rays of light streamed from the blessed’s face as he taught the catechism to the poor, or prayed by himself in the gatehouse. He said an amazing number of rosaries and made no less than twenty daily visits to the Blessed Sacrament. He is said to have liberated more than a million souls in purgatory, many of whom came back , while he was at prayer , to thank him for his help. At the time of his death, Our Lady, St. Dominic, his patron, St. John and many other saints, came to accompany him to heaven. They were seen by some of the brothers.